This paper empirically examines the relationship between house price change, metropolitan growth policies, and new housing supply in Australia's five major capital cities. Our hypothesis suggests capital cities with tighter regulations on new development will have fewer housing starts and price elasticities than those in less- regulated markets. The empirical procedure used in this paper utilises the Urban Growth Model of Housing Supply developed in Mayer and Somerville (2000a and 2000b) and employed in Zabel and Patterson (2006) by using quarterly data on housing approvals and house prices from 1996-2010. 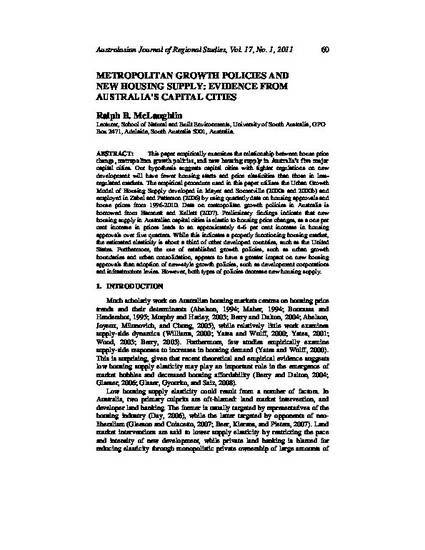 Data on metropolitan growth policies in Australia is borrowed from Hamnett and Kellett (2007). Preliminary findings indicate that new housing supply in Australian capital cities is elastic to housing price changes, as a one per cent increase in prices leads to an approximately 4-6 per cent increase in housing approvals over five quarters. While this indicates a properly functioning housing market, the estimated elasticity is about a third of other developed countries, such as the United States. Furthermore, the use of established growth policies, such as urban growth boundaries and urban consolidation, appears to have a greater impact on new housing approvals than adoption of new-style growth policies, such as development corporations and infrastructure levies. However, both types of policies decrease new housing supply. Copyright © 2011 Australia New Zealand Regional Science Association International Inc..